My approach promotes health and well-being of the body and mind. I use my skills in Osteopathy to support patients through their healing process in the best possible way for them. I use both cranial and structural approaches to treat a range of conditions as well as Western acupuncture in the management of acute conditions. When emotional factors like stress, anxiety and depression are the predominant causes of ill health Biodynamic Massage is a useful way of addressing these difficulties. When physical and emotional distress has it roots in childhood then Body Psychotherapy works at this deeper level of suffering. How I work with each individual depends on the cause of the problem and how each person wishes to engage with their process of health. Before becoming an Osteopath I worked in medical research for many years. I gained a BSc (Hons) in Microbiology from King's College, London University. Subsequently, I worked for Cambridge and Oxford University in the areas of Immunology, Molecular Biology and Pharmacology with several publications in research journals. My scientific background has given me a solid base for clinical reasoning in osteopathic practice. Whilst in science I gained a Diploma in Massage, Anatomy & Physiology and went on to use massage in the care of terminally ill patients at The Arthur Rank Hospice in Cambridge. I also taught massage to nurses in palliative care at The Homerton School of Health Studies. Through working hands on with people I realised I wanted to become an Osteopath. While studying Osteopathy I continued working part time in science. I qualified with a BSc (Hons) in Osteopathy from the London School of Osteopathy in 2001. I have been in practice since then. I have had post graduate training with the Sutherland Cranial College and worked for several years treating babies and children with cranial osteopathy. I have extensive experience in the treatment of chronic pain with many referrals from the West Suffolk Hospital, Pain Management Clinic. I added Western acupuncture to my skills for particular use in pain management and muscle relaxation. In 2007 I gained my certificate in Biodynamic Massage at the Cambridge Body Psychotherapy Centre. This form of massage recognises the emotional content of the body's tensions, making my practice of Osteopathy holistic in the broadest sense. 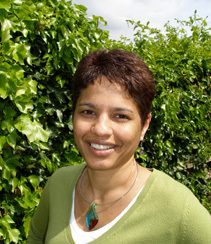 In 2011 I gained my certificate in Body Psychotherapy at the Cambridge Body Psychotherapy Centre. This form of psychotherapy looks at the body and the mind, the relationship we have with these two aspects of ourselves and how this can change for the benefit of our whole self. I am an associate member of The Chiron Association of Psychotherapists and work as an Integrative Body Psychotherapist. I hope my patients and clients benefit from my continued learning as much as I do.